You already bought a quality iPhone instead of your average cell phone, so why would you settle for a case that is made of cheap materials and can't fully protect such a good investment? The answer is that you wouldn't, and that's why you should get our iPhone 6 | 6s | 7 | 7s | 8 compatible case. We don't want you to worry about your phone, whether you are playing baseball, sitting at your desk, or having a night on the town. Our case doesn't make you settle for 1 layer of average protection but instead provides 2 heavy-duty layers of protection to keep your phone safe from falls and other possible disasters. The outside layer is made of ultra-durable plastic, and the second layer is a colorful silicone lining that stays close to the sides of your phone to keep it snugly in place. Although our case provides optimal protection and coverage for your phone, it still leaves certain sections open for access to your iPhone's accessories. Your camera, volume controls, and battery charging port are easily accessible so that you don't have to remove your case to use those important features. It's a great gift for anyone looking to take good care of their phone. Our ultra-clear phone case makes it possible to show off your shnazzy iPhone. The shape and color of your phone can be showcased with this transparent design. You can even personalize your case by adding scrapbook paper, fortunes from your fortune cookie, a little bit of bling, or inspirational quotes between your phone and the clear case cover. This case is made from high-quality acrylic materials. The acrylic provides a measure of shockproof protection from drops and falls. The edges and corners of your phone are first to sustain damage, but our acrylic case will provide protection for the corners and edges of your phone. GET THE PERFECT FIT: With our protective case, just throw your phone into your bag or pocket and trust that its case is the perfect fit to keep your phone safe. For your convenience, this case still gives you easy access to your iPhone 7S/6S camera, volume controls, headphone jack insert, and battery charging port without having to remove your case. SLIM AND DURABLE: Our acrylic gel cases are super slim and allow you to get optimal protection without sacrificing fashion. They are easy to put on and take off to readjust designs and other phone properties. Whether you are carrying your iPhone in your backpack, bag, purse, or pocket, it will be protected and not take up too much space. ULTRA-CLEAR APPEARANCE: Show off your fancy iPhone 7S/6S phone with this gloriously clear phone case. The crystal-clear cover preserves the original color of your phone. It also provides your phone with a sturdy grip so that it won't slip out of your hands. You can even put the fortune from your cookie or a fun picture inside this case to personalize your phone. DUAL PROTECTION CASE: Our expertly designed phone case is able to stay slim even with 2 protective layers. The slim fit makes it more convenient to keep with you, whether it's in your pocket, your purse, or your hands. The outside layer is made of ultra-durable plastic, and the second layer is a colorful silicone lining that stays close to the sides of your phone to keep it snugly in place. PROTECTIVE iPHONE COMPATIBLE CASE: Keep your iPhone protected while you're on the move! 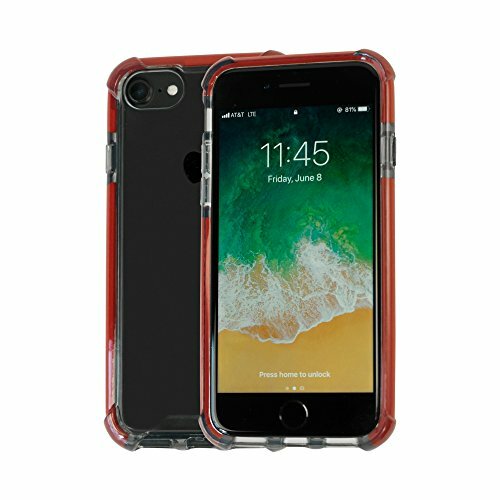 Whether you're running simple errands or playing a contact sport like football or basketball, our heavy-duty iPhone 7S/6S case will offer total protection even when things get crazy. Because our case is shock resistant and ultra durable, you can live your life without worrying about your phone 24/7. If you have any questions about this product by Idea Promo, contact us by completing and submitting the form below. If you are looking for a specif part number, please include it with your message.